It’s a common problem. You have a headache and reach for a bottle of aspirin only to discover that, according to the label, it “expired” six months ago. Do you take it or drive to the drugstore for a fresh batch? There isn’t a lot of information on medication packaging about just what “expired” means or what the risks, if any, are of taking medications that are past their expiration date. Read on to learn all you need to know about expired meds. According to Ilisa Bernstein, the deputy director of the Office of Compliance in the FDA’s Center for Drug Evaluation and Research, “The medicine expiration date is a critical part of deciding if the product is safe to use and will work as intended. Once the expiration date has passed there is no guarantee that the medicine will be safe and effective.” (Read the entire statement). The bottom line - the fact that a drug expiration date has passed doesn’t mean that the drug is no longer safe and effective, it means that that manufacturer no longer guarantees that it is safe and effective. In fact, many experts believe that drugs degrade very slowly and that package expiration dates represent a conservative view of when drugs should be discarded. In 2006, the Journal of Pharmaceutical Sciences published the results of a multi-year study of 122 drugs that had been used in the Department of Defense over the prior twenty years. On one hand, the study found that almost 90% of the drugs were stable for more than one year past their expiration date, with many drugs remaining stable for several years. On the other hand, stability varied considerably from drug to drug, and sometimes even across different batches of the same drug. It is also important to note that drugs maintained by the Department of Defense are stored in climate-controlled, regulated areas much different than your bathroom cabinet or car glove compartment. A 2012 study published in the Journal of the American Medical Association reached a similar conclusion, finding that most drugs remained potent far beyond their expiration date. Learn More - Watch "Expiration Dates Matter," a video by the Food and Drug Administration that summarizes the FDA position on expired medications. If any of the drugs you are taking can mean the difference between life and death (for example, nitroglycerin, insulin or EpiPens), do not take chances by relying on expired medications. Keep them up to date. Store drugs wisely. That generally means tightly closed, in a cool, dry place away from direct sunlight (and always in their original container to avoid taking the wrong drug by mistake). And it goes without saying that drugs should always be stored out of the reach of children or pets. OK, so you’ve made the decision never to use that five year old bottle of pills in your closet. What should you do with them? Whatever you do, don’t just leave them there. Drugs that languish in home medicine cabinets are susceptible to misuse, either intentional or inadvertent. More than 7 million Americans currently abuse prescription drugs and according to the Partnership for a Drug-Free America, about 2,500 teens a day use prescription drugs to get high for the first time. There are at least two ways to dispose of drugs properly. There are additional locations in Thurmont, Brunswick and Emmitsburg. You can learn more about the program at the Frederick County website. 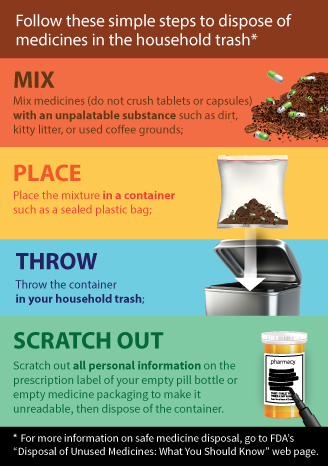 Scratch out any personal information on the label of your prescription bottle before disposing of it. For some drugs that are especially harmful, the FDA strongly recommends that they be deposited in a MedReturn box. If that is not possible, they should be flushed down a sink or toilet to eliminate the possibility of them being taken by someone for whom they were not prescribed. This list of especially harmful drugs can be found on the FDA website.